Avengers: Infinity War was a lot of fun. If, by ‘fun’, you mean it left us silently sobbing into the nearest cinema seat. 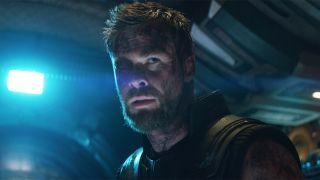 It destroyed us; it ruined us and, if Chris Hemsworth is to be believed, Avengers: Endgame might just finish the job. We had a feeling Marvel might up the ante even more next time around, but the God of Thunder has some very interesting comments as to how they might do so. Other reasons entirely, you say? That certainly puts a mental tick in the time travel theory column, should they want to go that way. But shocking sounds ominous. It sounds terrifying. Apocalyptic. My best guess? More deaths – ones we weren’t expecting, and ones that are absolutely permanent this time around. That, or Thanos might live to fight another day. That’s certainly a bold statement after Marvel has, arguably, been on the best roll yet with Thor: Ragnarok being followed by Black Panther and, of course, Infinity War. 11 months to go – we’d best start goodbye to each and every Avenger, y’know, just in case.